Since Karakamsha plays an important role in Jaimini astrology hence we shall deal it exhaustively in three to four parts. Here Jaimini enumerates the impact of various planets in the Karakamsha lagna and in the various houses from karakamsha lagna. In this part of article we have knowingly used translated words of Neelkantha and Krishan Mishra instead of original Jaimini sutras. The word Hkk- (Bha) means Hkk"kk] Vhdk or (Bhav of the sutra). Planets in the Karakamsha Lagna 1. भा. शुक्रे कारकांशे चन्द्रे शुक्रदृष्टे सति रसायन शास्त्रवेत्ता भवति। If the Moon is placed in Karakamsha lagna aspected by Venus, the native becomes a chemist. Here chemist does not mean that one will sell medicines but one will be engaged in the business/profession related to chemicals and it can be medicines also. 2. भा. कारकांशे चन्द्रे बुधदृष्टे वैद्यः। If the Moon be posited in Karakamsha lagna and aspected by Mercury the native will be a doctor. Here the word doctor relates to anybody engaged in healing the patients. 2. भा. कारकांशे कटके धनुषि वा चन्द्रेस्थितै शुक्र दृष्टौसत्यां स्वेत कुष्ठे च भवति। If sign Cancer or Sagittarius becomes Karakamsha lagna having the Moon posited therein and it is further aspected by Venus the native will suffer from white leprosy. Note: Sage has not given any reason but experience shows in case Moon and Venus both are influenced by malefics in that case too it is possible that one may suffer from the disease. 4. 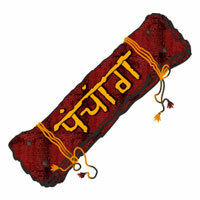 भा. शुक्र दृष्टि स्थाने कुजदृष्टौ सत्यां महारोगः। and the Moon is posited there in (as in above case) but instead of Venus this Moon is aspected by Mars one suffers from a long incurable disease. 5. भा. केतुना दृष्टे नील कुष्ठी भवतिः। In case sign Cancer or Sagittarius becomes Karakamsha lagna and here Venus is replaced by Ketu one will suffer from black leprosy. 6. भा. कारकांशे वा कुज राहुभ्यां योगे क्षयरोगेः। In case sign Cancer or Sagittarius becomes Karakamsha lagna and having the Moon in it. Further this Moon is conjoined by Mars and Rahu one will suffer from tuberculosis. Note: In whole of Jaimini astrology sage has not considered Sagittarius a benefic sign. This can be the only reason he has dealt it so harshly. When Cancer rises as Karakamsha lagna which is a watery sign, Cancer rules over chest and lungs and by the placement of Moon, a watery planet, and when both the sign and Moon are afflicted by fiery planet Mars and Rahu, who are capable of giving a long lasting disease, one may suffer from a disease like tuberculosis. 7. भा. पूर्वोक्त योगे चन्द्र दृष्टौ सत्यां निश्चयेन क्षयरोगः चन्द्र दृष्टय भावेक्षयस्स्वल्पः। कारकांशे कटके धनुषि वा चन्द्रे सति वा कुज राहुभ्यां योगे प्रबल क्षयो वाच्यः। In case sign Cancer or Sagittarius becomes Karakamsha lagna but is not occupied by the Moon but the influence of Mars and Rahu is there the tuberculosis/ disease will be in its initial stage but by the Moon's involvement by aspect or association the native suffers from advanced stage of tuberculosis/disease. 8. भा. तत्र वा कुजेन पिटकादि रोगो भवति। If the Karakamsha lagna is occupied by Mars alone the native may suffer from pimples, boils and ulcers etc. Note: Here the sage has emphasized the occupation of Karakamsha lagna by Mars only for causing the superficial skin related diseases but sage is silent about aspect of Mars on Karakamsha lagna. In our opinion due consideration should be given to Mars's aspect on Karakamsha lagna. Since Mars is most malefic and is a fiery planet it is capable of giving this type of disease. 9. भा. केतुना द्विधाकृत्य फल द्वयम्। ग्रहणी शैत्य रोगश्च। If Ketu happens to occupy or aspect the Karakamsha lagna, two types of predictions can be made. (a) If Ketu is between 0° to 15°, one suffers from recurrent bouts of dysentery. (b) If Ketu is between 15°to 30° one suffers from recurrent cold. 10. भा. तत्र वा राहु गुलिकौ यदि स्यातांतर्हि मूषिकादि विषाणि भवन्ति। If Rahu and Gulika happen to occupy the Karakamsha lagna native is troubled by poison due to bites of poisonous reptiles or native may be administrated poison by others. NOTE: In these Sutras sage has commented about the influence of various planets on the Karakamsha lagna hence a big question arises here. Karakamsha lagna is one which contains the supreme planet viz. Atmakaraka hence it can be deduced that the above rules should also be applied with reference to Karakamsha lagna in the natal chart. In that case mark the Karakamsha lagna in natal chart and note the influence of various planets on Karakamsha lagna. Example: Male Native 11.5.1951, 08.45, Moga(Punjab) Longitude :75E10' Latitude:30N48' Atmakarak : Mars Karakamsha Lagna : Dhanu (K.L.) •	Sign Gemini rises in the lagna. Lagna and every planet is shown in the natal chart with their longitudes. •	Mars is placed at highest longitude viz.29 degrees 18 minutes hence Mars is Atmakaraka. •	Atmakaraka Mars is occupying sign Sagittarius in Navamsha chart hence Sagittarius becomes Karakamsha Lagna. •	Karakamsha Lagna is occupied by Venus and obliviously Mars also being Atmakaraka. But being supreme planet this did not give any disease as indicated by Mars being in Sagittarius hence Atmakaraka proved to be a savior. •	In the Natal chart sign Sagittarius is falling in the 7th house and it can be marked as Karakamsha Lagna in natal chart. •	This Karakamsha Lagna in natal chart is being aspected by Moon and Venus from lagna, native has been engaged in a chemical and pharmaceutical manufacturing unit. Thus rule No.1 applies. •	No doubt Jupiter as well as Saturn both are aspecting the Karakamsha Lagna but we shall restrict to a specific rule only. Note: It is highly desired that while studying Karakamsha Lagna ample attention should be paid to Karakamsha Lagna chart as well as Karakamsha Lagna in the natal chart. Planets in the Second House from Karakamsha Lagna While dealing the impact of planets on the 2nd house of Karakamsha lagna we have again taken Hkk"kk (Translation) only. Here we have used 1st sutra only to explain the Katpayadi value as advocated by Jaimini. 1. सूत्र: तत्र रवौ राजकार्य परः। The word Tatra (26/12=2) as per Katpayadi value indicates the 2nd house. When the Sun be placed or aspecting the 2nd house from Karakamsha lagna the native is engaged in public service. Here public service means that the native will be in government job, a political worker or a politician. Sage lays down a condition here that the Sun while influencing the 2nd house of Karakamsha lagna should be strong by being in its own sign or sign of exaltation. The influence of a powerful Sun can make the influence of native even a minister. In case the Sun's influence is weak, the native will be low class government employee and in case weak Sun is further afflicted one may get defeated in the election. Note: Being a natural rajya kripa karaka strong Sun is capable of lifting the native to a very high position, whereas the impact of a weak Sun is not appreciated by the sage in the 2nd house from Karakamsha lagna. 2. भाः कारकांशात् द्वितिये पूर्णचन्द्र शुक्रयौ स्सतौः भोगी विद्या जीवी च भवति तत्र पूर्ण चन्द्रे सति भोगी, शुक्रे तु विद्या जीवी। भोग परिमाणं विद्या परिमाणं च तत्फल मालोच्य वाच्यम। बलपरिज्ञानं यथा संमलं योगानुसारेण कर्तव्यभित्येन निष्कर्षः। When the full Moon (Pakashbali strong) and Venus together conjunct or aspect the 2nd house from Karakamsha lagna, native leads a luxurious life. Native will be blessed with all types of comforts. The quantum of comforts and luxuries depends upon the strength of the Moon and Venus 3. भा. कारकांशे द्वितीये कुजे द्रेक्काणानुसारेण त्रीणि फलानि। कुजे प्रथम द्रेक्काणे धातुवादी भवति रसायन परिज्ञता वा स्यात्। कुजे द्वितीय द्रेक्काणे कुन्त नामक शस्त्रधारी भवति। कुजे तृतीये द्रेक्काणे वह्नि जीवनकर्ता भवति। कर्मकारस्सपकारो वा भवति। When Mars influences the 2nd house from Karakamsha lagna the sage suggests three types of predictions depending upon the longitude of Mars. (a) If Mars is between 1° to 10°. native may earn his livelihood from metallurgy and chemicals etc. (b) If Mars is between 10° to 20°, native keeps a weapon by the name of Kaunta, in modern era it may be replaced by modern weapons or one may serve in army or other armed forces. (c) If Mars is between 20° to 30°, native earns his livelihood by being a goldsmith, blacksmith or he may be engaged in a hospitality job. 4. भा कारकांशत् द्वितीये बुधसति राशिभागान् चतर्धाकृत्य। प्रथम भागेवाणिज्यः। द्वितीय भागे तन्तुवायाः। तृतीय भागे शिल्पिनः। चतुर्थ भागे व्यवहारविदो भवन्ति। Here sage refers to the influence of Mercury on the 2nd house from Karakamsha lagna. 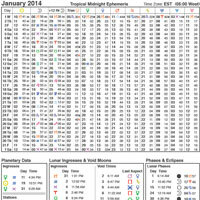 Here again he suggests different types of predictions depending upon the longitude of Mercury. (a) In case Mercury’s longitude is between 0° to 7.5° one earns his livelihood through business. (b) In case Mercury is between 7.5° to 15° one can be a weaver or a cloth merchant, in modem days weaver can be taken as textile engineer. (c )If this Mercury is placed between 15° to 22.5° the native can be engaged in fine arts or native can be a sculptor. (d) If Mercury is placed between 22.5° to 30° one is a litigant means native can be a lawyer or a judge depending upon the strength of Mercury . 5. भा. कारकाशांत् द्वितीये गुरौ सति कर्मज्ञान निष्ठा, कर्मनिष्ठाः, ज्ञाननिष्ठाः वेदविद इति त्रीणी फलानि वक्तव्यानि। If Jupiter influences the 2nd house from Karakamsha lagna the native is deeply interested in pursuing the religious rites, will have deep philosophical knowledge and in case Jupiter is strongly disposed in the chart native is well versed in religious scriptures and Vedas and is highly educated in the field of religion. 6. भा. कारकांशात द्वितीये शुक्रे सति राजकीयाः भवन्ति। कामिनो भवन्ति, शतेन्द्रियाः भवन्तिः। शत वर्ष जीविनो भवन्तित्वर्थः। Venus influencing the 2nd house of Karakamsha lagna and if Venus is powerful in the chart, native will be a government or political official. He is very passionate and lascivious and will be virile till the age of hundred years. Note: Since Venus is significator of beauty, passion, luxuries and virility hence a strong Venus in the 2nd house to Karakamsha lagna provides all these qualities to the native. As the sage has said that one remains virile till hundred years is a symbolic quality of Venus and one should not apply this verbatim. The crux of this saying is that a strong Venus keeps one young till a long period of age. 7. भा. कारकांशात् द्वितीये शनौ सति महता यज्ञादि कर्मणा प्राचीनानां। पित्रादीनां कर्मणा वा जीवति। If Saturn is posited in the 2nd house to Karakamsha lagna the native makes his : livelihood by performing yajnas. He adheres to ancient customs and traditions. Here sage is clear about the qualities of Saturn of making the native an ascetic or sanyasi. 8. भा. कारकांशात् द्वितीये राहो कृत्वा पंचफलानि शन्युक्त फलानि त्रीणी जांगुलिकाः लोहयन्त्रिणश्च। If Rahu be posited in the 2nd house of Karakamsha lagna , the native lives as a good warrior wielding bows and arrows but in modern times, bows and arrows should be replaced with guns, machineguns and modern war weapons. An afflicted Rahu here makes the native a cheat, one may earn one’s livelihood by stealing and dacoity. In case Rahu here is influenced by Saturn one becomes an expert medical man dealing with poisonous drugs and medicine. Note: The word èkkuq"dk used by sage means bows and arrows, and in modern era this should be replaced by modern weapons used in warfare. While stealing and dacoity can be replaced by smuggling, black-marketing etc. finally both Rahu and Saturn are significators of poison and modern medicines are all poisonous. 9. भा. कारकांशात् द्वितीये केतौ सति गज व्यवहारिणश्चेराश्च। When Ketu is posited in the 2nd house to Karakamsha lagna and is associated or aspected by only benefics he is engaged in the trading of elephants but in today’s parlance elephants can be replaced with modern vehicles. In case Ketu is under the influence of Mars and Saturn native will be a notorious thief, which means he can be a smuggler or a gangster etc. 10. सूत्र नं. 35: तत्रकेतौ पापदृष्टे कर्णच्छेदः कर्ण रोग वा। If Ketu be placed in the 2nd house of Karakamsha lagna and is being aspected by only malefics the ears of native will be cut off. In case Ketu is influenced both by benefics and malefics native will suffer from some ear related disease. Note: This sutra is contrary to sutra No.9 but since Neelkantta and Krishan Mishra have their own opinion hence it is left to readers to verify the facts. 11. सूत्र नं. 36: शुक्र दृष्टे दीक्षितः। In case Ketu be posited in 2nd house of Karakamsha lagna and is aspected by a powerful Venus the native performs yajnas. 12. सूत्र नं. 37: बुध शनि दृष्टे निर्वीर्यः। If Ketu happens to occupy the 2nd house of Karakamsha lagna and is associated with or aspected by both Mercury and Saturn the native will be impotent. 13. सूत्रः 38 भा. कारकांशत् द्वितीये केतौ बुध शुक्राभ्यां दृष्टे सति पुनः पुनर्वचनं कथयिता भवति। पुनर्भू पुत्रोभवतीति केचित्। पवन व्याधिका नित्यन्ये। तस्मिन्नेव पापग्रहेदृष्टे दासीपुत्रो भवति। In this sutra sage mentions about the presence of Ketu in the 2nd house of Karakamsha lagna and Ketu is further associated with Mercury and Venus. While translating the above sloka which is outcome of sutra , commentator has used iquoZpua that is one will speak repeatedly or it can be assumed that the native will have speech related problems iquHkwZ iq=ksHkorhfr that one may be born from a woman who has married for the second time, iou O;kf/kek some of the commentators opine that native is likely to suffer from a windy disease, ikixzgsn`"Vs nklhiq=ks Hkofr If the above combination is under the aspect of malefics one is born to a maid servant. Note: Out of Rahu and Ketu, Jaimini has given importance only to Ketu. He has discussed about the placement of Ketu in the 2nd house to Karakamsha lagna and the impact of various planets on it and thus combined effect of all these. In our article on Argala it was mentioned that Ketu is capable of forming argala by using sutra foijhra dsrkS while about Rahu sage is very much critical. Regarding Rahu sage opines if a powerful benefic argala is present in the chart but Rahu also joins these argala forming planets "Rahu is a drop of poison in the pot of milk". Since there is paucity of literature on Jaimini Astrology hence fellow astrologers and readers are requested to probe more and more on this system of astrology. Example : Harshad Mehta, 29.7.1954, 10.30, Mumbai, Long : 72E50' Latitude : 18N58' AK- Venus, K.L- Scorpio (Horoscope Curtsey Selected Horoscopes By Nishkam Peeth Prakashan Page No.96) •	Sign Virgo is rising in lagna. Longitudes of lagna and that of all the planets have been shown in birth chart. •	Venus with highest longitude viz.24°.47' becomes Atmakaraka and is occupying sign Scorpio in navamsha chart. •	Atmakaraka Venus is occupying sign Scorpio in Navamsha chart. Thus Scorpio is Karakamsha Lagna. •	Though Saturn is posited in the 2nd house of Karakamsha Lagna but native has none of qualities as mentioned by sage. •	In the natal chart from 2nd house of Karakamsha Lagna both Rahu and Mars are posited and the rule applies fully. Native was one of the greatest cheat of the century . Planets and the Third House from Karakamsha Lagna 1. भा. कर्मणि (51झ्12त्र3) कारकांशात् तृतीये पापग्रहे सति राजयोगवान् पुरुषशशूरो भवति। A malefic planet in the 3rd house from karakamsha lagna makes the native a brave man. This rule is as good as it is in traditional astrology since third house mainly indicates courage hence a malefic planet in a malefic house makes a native courageous. 2. भा. कारकांशात् तृतीये शुभग्रहे सति भयार्तो भवति। A benefic planet in the 3rd house from karakamsha lagna makes the native coward or timid. Rule No.2 is just opposite to rule No.1 a benefic planet is never appreciated in a bad house. 3. भा. तृतीय षष्ठयोः पाप ग्रहे सति कर्षको भवति। कृषको नाम कृषजीवी। If malefic planet/planets are placed in the 3rd and 6th house from the karakamsha lagna the native will be a cultivator of lands. In this sutra the sage has appreciated the presence of malefic planet/planets in 6th house from the karakamsha lagna. There can be two reasons for this, first like 3rd house the 6th house is also a bad house and secondly both 3rd and 6th houses are upachaya houses. In modern time a native having this type of configuration may not be a cultivator but will be the owner of huge agriculture land. 4. भा. तृतीय षष्ठयोः पाप ग्रहे सति कारकांशान्नवमे गुरौ राज योगोद्भवस्यापि निकर्षकत्वम्। In case the 3rd house and the 6th house from the karakamsha lagna be occupied by malefic planet/planets and simultaneously Jupiter be placed in the 9th house from the karakamsha lagna confers a powerful rajayoga on the native apart from huge agricultural land. 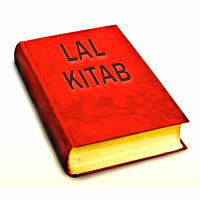 Note: keeping in view the importance of the karakamsha lagna we will take up the rest of houses in the next lesson. Example : Adolf Hitler 20.04.1889, 18.30, Brabhaw, Long : 13E02' Lati : 48N15' (Horoscope Curtsey Selected Horoscopes by N.P.P. Page No.05) •	Sign rising in lagna is Libra at 4°23' Longitudes of all the planets have been shown in the birth chart. •	Venus is placed at 24° 23' i.e. having highest longitude amongst all the planets hence Venus becomes Atmakaraka. •	Sign Scorpio rises in Navamsha chart and Atmakaraka Venus is placed in the navamsha lagna along with navamsha lagna lord Mars. •	Since Atmakaraka Venus is placed in Sign Scorpio hence sign Scorpio becomes Karkamsha Lagna. •	Third house from Karkamsha Lagna is having sign Capricorn with its lord viz. Saturn posited there in. Further 3rd house from the Karkamsha Lagna is aspected by Mars. •	Saturn occupying its own sign in 3rd house from the Karkamsha Lagna and Mars is aspecting it which happens to be the exaltation sign of Mars. Powerful influence of two first rate malefic planets on the 3rd house of Karkamsha Lagna made the native a fearless and most dreaded dictator of its time. NOTE: The most important point to remember is that the impact of planets should be studied in Karakamsha Chart, Navamsha chart and KL. in natal chart. Example: K.P .S.Gill 29.12.1934, 17.00, Cochin. Long:76E14' Lati:09N58' (Horoscope Courtsey Selected Horoscopes N.P .P. Page No 134) •	Sign Aries rises in lagna at17°59' •	Venus is placed at 23° 44' in Sagittarius and s having the highest longitude amongst all the planets hence Venus becomes Atmakaraka. •	Venus, Atmakaraka planet is occupying Scorpio in Navamsha chart while Virgo rises in Navamsha lagna. •	Scorpio becomes Karkamsha Lagna. In the natal chart 3rd house from Karkamsha Lagna is having Rahu without any other malefic influence on it. •	In Navamsha chart 3rd house from Navamsha lagna contains Atmakaraka which is Karkamsha Lagna also. •	From Karkamsha Lagna 3rd house is having sign Capricorn. The 3rd house is aspected by exalted Saturn from the 2nd house of Navamsha Lagna while Mars aspects it from the 9th house of Navamsha lagna. •	Thus the aspect of exalted Saturn on the 3rd house of Karkamsha Lagna and the aspect of Mars, who happens to be the Karkamsha Lagna lord, gave the native supreme powers in police services and he was a most fearless officer throughout his career. Example : Male Native. 08.05.1965, 08:45, Chandigarh, Long:76E48', Lati:30N45' •	Gemini rises in lagna at 12°17' •	Mercury is placed at 27° 36' and is having the highest longitude amongst all the planets. •	Mercury becomes Atmakaraka and is occupying Pisces in Navamsha chart thus Pisces becomes Karkamsha Lagna. 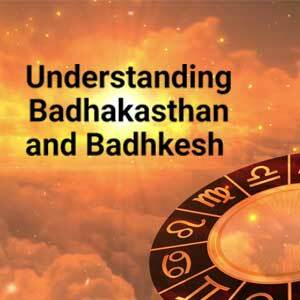 •	In the Navamsha chart 3rd house from Karkamsha Lagna is aspected by the benefics Moon and Venus while Rahu and Ketu both malefic planets are also aspecting it. Thus it has mixed influence of benefic planets that and malefic planets has given the mixed type of results viz. native acts as if he is very bold and fearless person but in real life he is a coward and timid person. 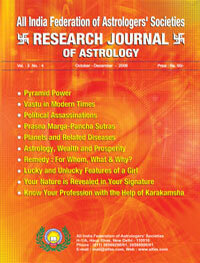 •	If we study the results from the Karkamsha Lagna, 3rd house from it contains Venus who is placed in its own sign, the first rate benefic Jupiter is also placed here along with malefic Rahu, again indicating the results as mentioned above. •	Apart from 3rd house from the Karkamsha Lagna, 6th house from it in the natal chart is having Mars. Rule No.3 applies since native owns huge urban as well as agricultural land.